This new study refutes Nordicist and Afrocentrist claims of population replacement in Ancient Greece, showing that modern Peloponnesean Greeks are most closely related to other Southern Europeans, and far from both Slavic and non-European groups. They're also distinct from Greek-speaking populations in Asia Minor, only partly overlapping with those on the Aegean coast nearest to Greece. Peloponnese has been one of the cradles of the Classical European civilization and an important contributor to the ancient European history. It has also been the subject of a controversy about the ancestry of its population. In a theory hotly debated by scholars for over 170 years, the German historian Jacob Philipp Fallmerayer proposed that the medieval Peloponneseans were totally extinguished by Slavic and Avar invaders and replaced by Slavic settlers during the 6th century CE. Here we use 2.5 million single-nucleotide polymorphisms to investigate the genetic structure of Peloponnesean populations in a sample of 241 individuals originating from all districts of the peninsula and to examine predictions of the theory of replacement of the medieval Peloponneseans by Slavs. 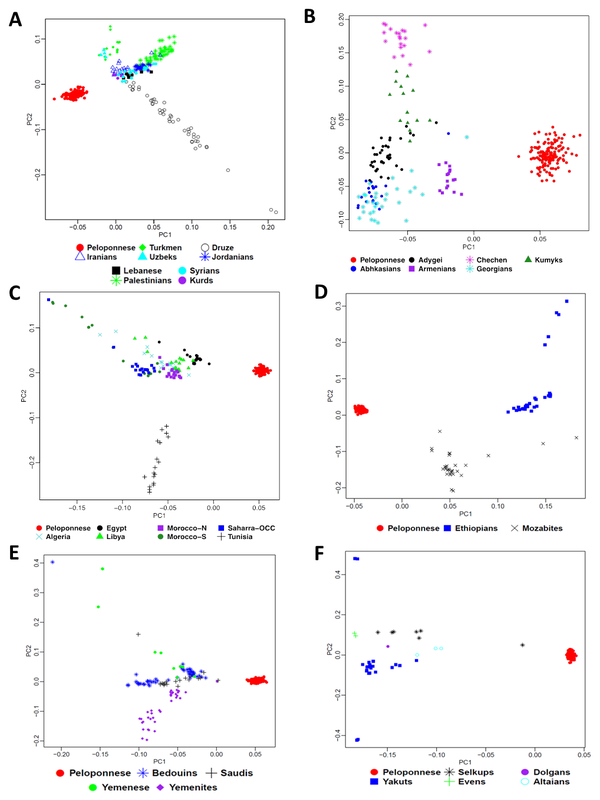 We find considerable heterogeneity of Peloponnesean populations exemplified by genetically distinct subpopulations and by gene flow gradients within Peloponnese. 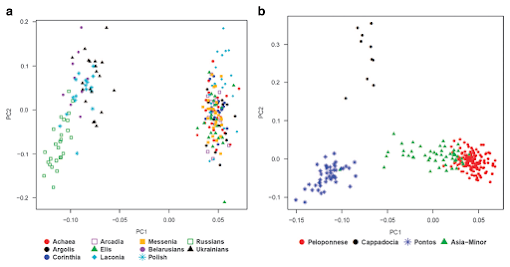 By principal component analysis (PCA) and ADMIXTURE analysis the Peloponneseans are clearly distinguishable from the populations of the Slavic homeland and are very similar to Sicilians and Italians. Using a novel method of quantitative analysis of ADMIXTURE output we find that the Slavic ancestry of Peloponnesean subpopulations ranges from 0.2 to 14.4%. Subpopulations considered by Fallmerayer to be Slavic tribes or to have Near Eastern origin, have no significant ancestry of either. This study rejects the theory of extinction of medieval Peloponneseans and illustrates how genetics can clarify important aspects of the history of a human population. Figure 2: Genetic similarity of Peloponneseans, Sicilians and Italians. PCA analysis of several European populations. (a) Notice the north to south distribution of the populations and that the Peloponneseans are placed to the far right of the graph and overlap with the Sicilians. 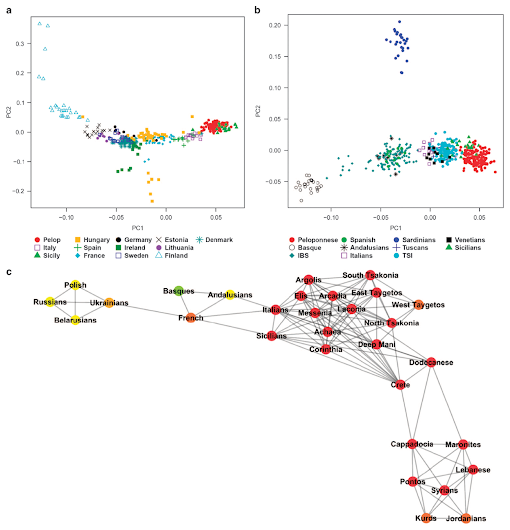 (b) PCA analysis of Southern European populations illustrating the close relationship between Peloponneseans, Sicilians and Italians (TSI is an Italian population). (c) Network analysis illustrating the high connectivity between the Peloponnesean populations as well as between the Peloponneseans, the Sicilians and the Italians. Notice the distance between Peloponneseans and the Slavic, and Near Eastern populations. Peloponneseans are connected with the Near Eastern populations through Crete and Dodecanese. Figure 3: Testing the theory of replacement of medieval Peloponneseans by Slavs and Asia Minor settlers. 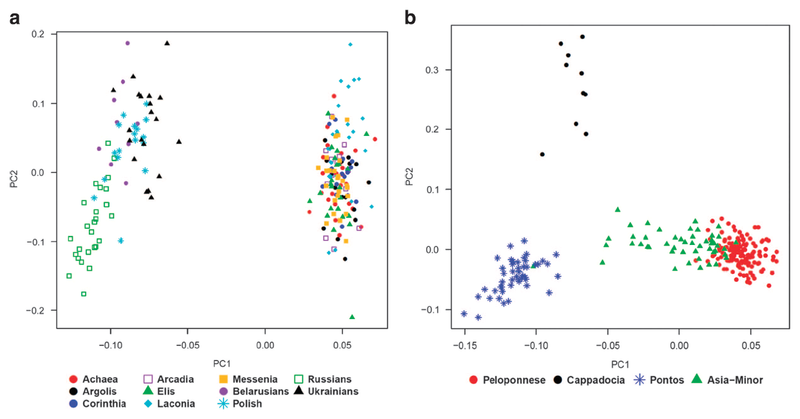 (a) PCA analysis shows the broad separation of Peloponneseans from four populations of the Slavic homeland (Ukrainians, Polish, Russians and Belarusians). (b) PCA comparisons of the Peloponneseans with three Greek-speaking Asia Minor populations shows only partial overlap with the population of the Asia Minor Aegean coast. Supplementary Figure 2: Comparisons of Peloponneseans with non-European populations. PCA analysis of Peloponneseans and A. Near East. B. Caucasus. C. North Africa. D. East Africa. E. Arabia. F. West Siberia populations. Stamatoyannopoulos et al. "Genetics of the peloponnesean populations and the theory of extinction of the medieval peloponnesean Greeks". Eur J Hum Genet, 2017.